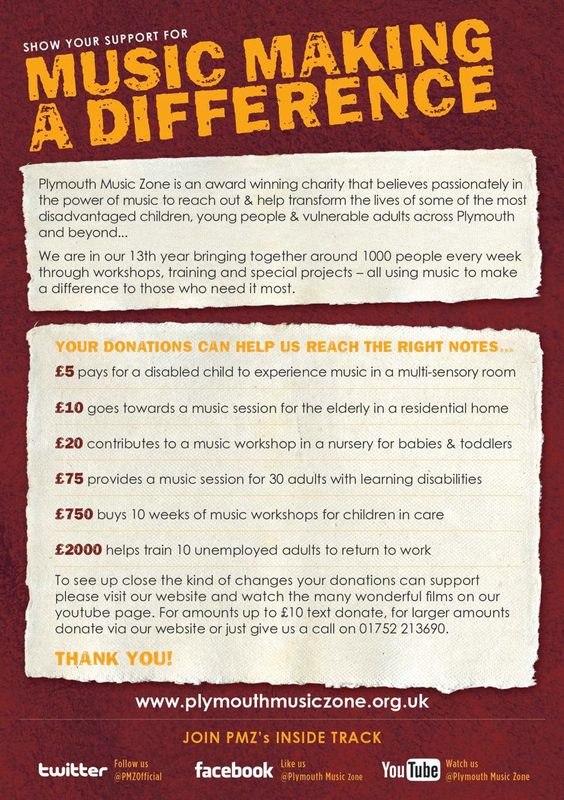 Plymouth Music Zone receives no government funding or guaranteed income so our small team works extremely hard to raise up to £500,000 every year from as many sources as we can. Your kind donations are vital. They help us reach over 1000 vulnerable young people and adults in the many children's centres, special schools, community centres and care homes we work in across Plymouth and beyond. Virgin's money giving page allows you to make a one-off donation or set up a regular donation. Just link through and then choose the right option for you. It allows you to donate with your credit card or via paypal if you prefer. Or you can also donate directly via paypal by clicking the donate button below on the right. If you are a UK taxpayer you can complete our PMZ Gift Aid form which means that PMZ will receive an additional 25p for every £1.00 you donate! You can choose to make a one-off donation or donate on a regular basis directly through your bank. Just download the form, complete it and post it to PMZ, Raglan Road, Devonport, Plymouth, PL1 4NQ or email it to glyn@plymouthmusiczone.org.uk and we'll do the rest. You will be asked if you wish to giftaid your donation. Please be assured you will not receive any unwanted texts as a result of text donating and since this is a free service we will receive all of the donation. See TEXT GIVING FLYER front and TEXT GIVING FLYER back for more info. Who you would like us to thank, if anyone e.g. a group or organisation or just yourself? Please help us by using our Gift Aid form if you are a UK tax payer. PMZ will receive an extra 25p for every £1.00 you donate! You can also specify whether you wish to make a one-off donation or would like to donate regularly through your bank. SEE OUR CHANGING LIVES SECTION TO SEE MUSIC MAKING A DIFFERENCE OR VISIT OUR YOUTUBE CHANNEL TO SEE FOR YOURSELF. THE POWER OF MUSIC IS IN YOUR HANDS TOO, SO THANK YOU.